Lori's Star uses the Ohio Star quilt block as the centre of the completed block. Additional squares and triangles surrounding the centre block make this a new and different variation. 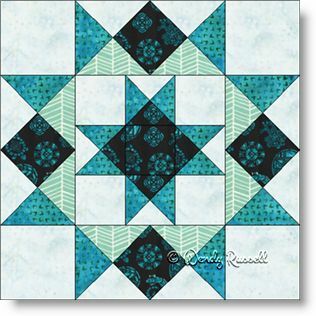 I would consider this quilt block as an intermediate level due to the number of pieces required. However, don't let that stop you. With careful regard to your quarter inch seam allowance, you will experience no difficulty. The two sample quilts illustrated show a quilt setting on point, with alternate blank blocks (to showcase your quilting skills) and a second quilt with blocks set side-by-side. There is no end to the designs you can create for your own quilt.